Graham’s Alyssa Theodor blasts a home run in the first inning of Monday’s game against Urbana. Theodor leads the CBC in dingers with six. Graham’s Sam Stickley works to lay down a bunt against Urbana on Monday. ST. PARIS – Graham defeated Urbana, 4-0, in CBC/MRD baseball on Monday. The Falcons scratched two runs across in the first inning and a couple more in the sixth to earn the win. For Graham (6-2-1), Josh Lewis was 2-for-3 with 2 RBI and Chase Adams was 1-for-2. Lane Smith and Logan Thompson each doubled. Andy Milligan pitched the complete-game shutout, striking out 10 on 101 pitches. For Urbana (1-7), Riley Wilson was 2-for-4. The Falcons and Hillclimbers meet again on Wednesday at Urbana. ST. PARIS – Graham downed Urbana, 10-0, in CBC/MRD softball on Monday. For the Falcons, Lindsay Brayton was 4-for-5 with a double, two home runs and 5 RBI, Alyssa Theodor was 2-for-4 with a home run and 3 RBI, Sara Masters was 2-for-5 with an RBI and Morgan Pine was 2-for-3 with 2 RBI. For Urbana, Maleah Murphy was 1-for-3, Emily Skelley was 1-for-3 and Sarrah Baldwin was 1-for-1. The teams meet again on Wednesday at Urbana. WEST LIBERTY – WL-S beat Triad, 8-1, in OHC baseball on Monday. Trevor Woodruff tossed a complete game, allowing 1 unearned run on four hits while striking out three. For the Tigers (2-3, 2-2), Woodruff drove in 3 runs on 2 hits to further help his cause. Patrick Harr drove in the first run of the game on a 2-strike, 2-out pitch up the middle, scoring Woodruff to put the Tigers up in the bottom of the second. Triad tied it up at 1-1 in the top of the third on a sacrifice fly, plating Coleman Hauke, who led the inning off with a single. The Tigers then went on to score seven unanswered runs over the next four innings to clinch the win. Offensively for the Tigers, Christian Griffith was 2-for-4 with 2 runs scored an an RBI, Zack Glock was 2-for-4 with an RBI and a run scored and Woodruff was 2-for-3 with 3 RBI. The WL-S jayvees also won, 9-4. Hayden Phillips was 2-for-3 with 3 runs scored and an RBI and Isaac Reames was 2-for-2 with 2 runs scored and 2 RBI in that one for the Tigers. WL-S will play at Springfield Catholic Central today. 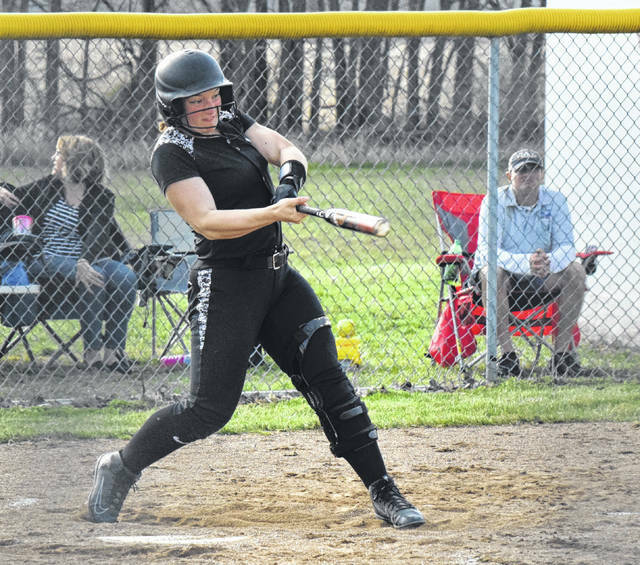 WEST LIBERTY – WL-S defeated Triad, 7-0, in OHC softball on Monday. For the Tigers (7-4, 3-2), Camrin Rice was 2-for-3 with 2 RBI, Kayle Henderson was 2-for-4 with a double and 2 RBI, Arrah Sandy was 2-for-2 with a run scored, Maddie Estes was 2-for-4, Hallie Strapp doubled and Kelsey Day doubled. For the Cardinals (4-2, 3-2), Kendell Hughes was 2-for-3 with a double. Triad plays at Greenon today while WL- S goes on the road to Catholic Central. MILFORD CENTER – Mechanicsburg defeated Fairbanks, 13-1, in six innings of OHC softball on Monday. For the Indians (5-1, 5-0), Taylor Hurst was 4-for-5 with 4 RBI from the leadoff position. Audrey Ayars was 2-for-5 with a double and 2 RBI, Hanna DeLong was 3-for-4 with two doubles and an RBI, Morgan Heizer was 2-for-4 with two doubles, Francys King was 2-for-3 with 2 RBI and Mallory Blakeman was 3-for-4 with a double and an RBI. Mechanicsburg plays at Greeneview today. MILFORD CENTER – Mechanicsburg committed five errors en route to a 16-4 loss to Fairbanks in OHC baseball on Monday. “We kicked ourselves in the foot,” MHS Coach Bryan Eyink said. Daniel Burchett was 2-for-3 with a run scored, Aaron Conley was 2-for-3 and Jake Edwards was 1-for-2 with 2 RBI for the Indians (3-3). 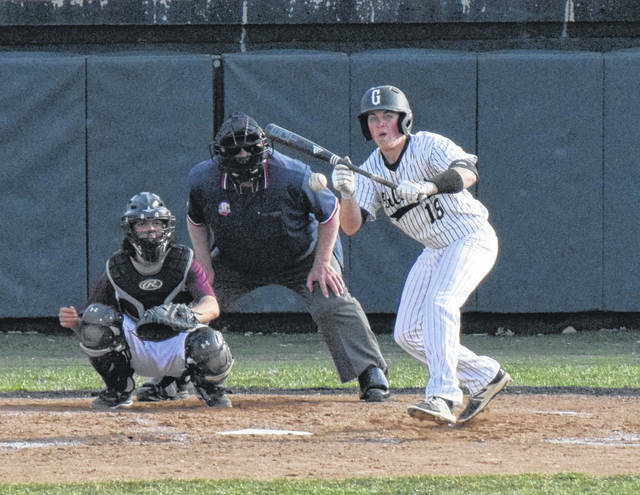 NORTH LEWISBURG – Triad defeated Urbana, 6-4 and 11-0, in a doubleheader of non-league baseball on Saturday. In the first game, Isaiah Bruce got the win while striking out 11, walking 4 and giving up 4 hits. The Cardinals jumped out to a 5-0 lead. Leading the attack was Dylan Warner, who went 2-for-3 with 2 RBI, and Austin Bails, who was 2-for-4. For Urbana, Gabe Spiers was 2-for-3 with a triple and an RBI and Nick Pelfrey doubled and knocked in a pair of runs. Daniel McKenzie also had a double. In the second game, Blake Boldman got the win, allowing 3 hits and fanning 5. Jordan Simonelli was 4-for-4 with a triple, Isaiah Bruce was 2-for-3 with 2 steals and 2 runs scored and Logan McCoy was 2-for-4 with a steal for Triad. For Urbana, Nick Weyrich, Spiers and Austin Rooney each had a hit, with Spiers doubling. PIQUA – Graham defeated Piqua, 6-2, in non-league baseball on Saturday. Josh Dooley was 2-for-4 with a double and an RBI, Josh Lewis was 1-for-4 with a double and 2 RBI and Lane Smith was 1-for-4 with a double and 2 RBI for the Falcons. WEST LIBERTY – WL-S split a weekend doubleheader with Kenton Ridge on Saturday, losing the first game, 6-5, before winning, 9-8, in the nightcap. In the first game, Kelsey Day was 2-for-4 with a home run and 2 RBI and Aubrey Williams was 1-for-3 with a double and 2 RBI. In the second game, Day was 3-for-3 with a double and 3 RBI, Rachel Hostetler was 3-for-4, Kaylah Erwin was 1-for-2 with a double and an RBI, Kayle Henderson was 2-for-4 with 2 RBI and Maddie Estes was 2-for-3. The jayvees split with Springfield, taking a 9-1 win before losing, 11-6. Aleah Reed and Braxton Givens each had 3 hits in the first game for the Tigers. Alexa Stoll hit a home run and had 2 hits in the second game, with Reed also picking up 2 hits. MECHANICSBURG – Mechanicsburg swept Emmanuel Christian, 13-3 and 8-3, in non-league baseball on Saturday. In the first game for the Indians, Mack DeLong was 4-for-4 with 3 RBI and 2 runs scored, Daniel Burchett was 2-for-3 with 3 runs scored and Noah Wolf was 2-for-4. In the second game, Jake Edwards was 2-for-3 with an RBI and JD Swenson was 2-for-3 with 2 RBI.